Every two years, Mon­treal, Que­bec, Canada fea­tures a major, month-long major con­tem­po­rary pho­tog­ra­phy fes­ti­val called Le mois de la photo à Mon­tréal. This year’s fes­ti­val runs from Sep­tem­ber 5 — Octo­ber 5, 2013 and fea­tures 25 pho­tog­ra­phy exhi­bi­tions in dif­fer­ent parts of the city. 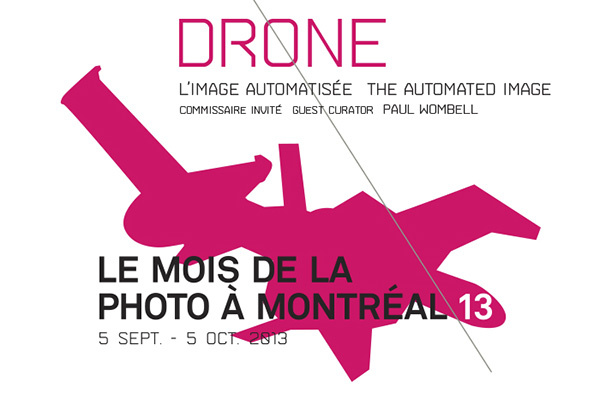 This year the theme of the fes­ti­val is Drone — The auto­mated image and it is guest curated by Paul Wombell. I’ve been going to this fes­ti­val pretty much since it started and the exhi­bi­tions are almost always laden with exper­i­men­tal (less con­ven­tional) pho­tog­ra­phy and themes that require reflec­tion. If you’re look­ing for more con­ven­tional pho­tog­ra­phy (beau­ti­ful land­scapes, still lifes, street pho­tog­ra­phy) you nor­mally won’t find it at this festival. Although Le mois de la photo is a pho­tog­ra­phy fes­ti­val, many exhi­bi­tions will be video based and some will fea­ture instal­la­tions. I always find a few exhi­bi­tions that I really like and will report back on my faves. Feel free to check out the exhi­bi­tions here. I’ve added a new cat­e­gory to the blog called Mon­treal art, pho­tog­ra­phy and cul­ture and I’ll use it to cover some of the cooler events in this fes­ti­val city that I call home. 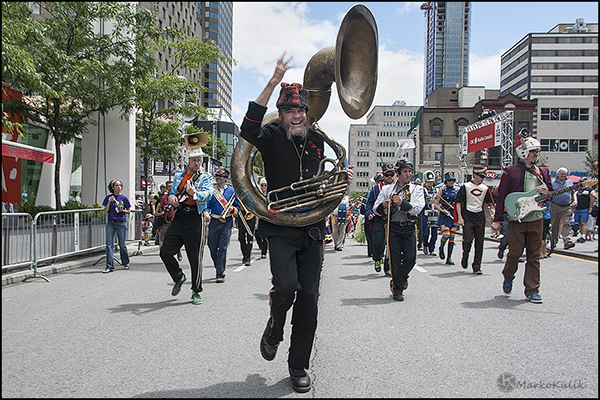 Even if you can’t make it to Montreal’s world class fes­ti­vals, hope­fully this new pho­tog­ra­phy blog cat­e­gory can turn you on to some­thing new. This week the world famous Mon­treal Inter­na­tional Jazz fes­ti­val is in town and it fea­tures hun­dreds of world class musi­cal acts and street per­for­mances. 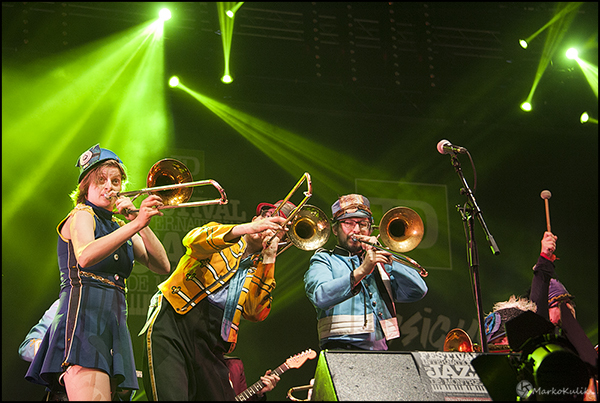 The Jazz fes­ti­val is one of the best fes­ti­vals in our city and I attend almost every year. 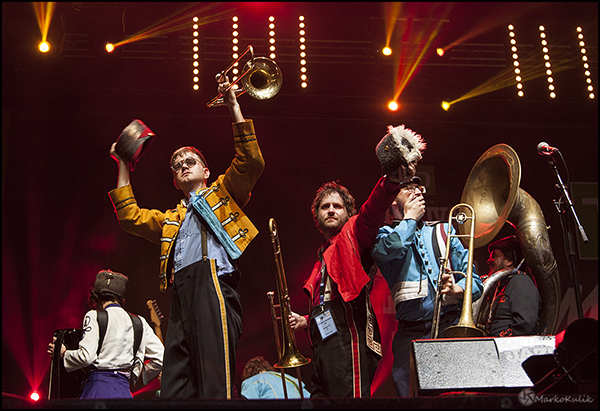 This year a friend of mine, Mon­treal Cul­ture Guy Chris ‘Zeke’ hand, invited me to see a 30 piece Chicago Hip­ster march­ing band called Mucca Pazza. They were so fab that I saw them twice. Had I had more time I would have gone again. This band INSTANTLY makes you smile and makes your brain release endor­phins. Just try not to smile when you see them, I dare you! 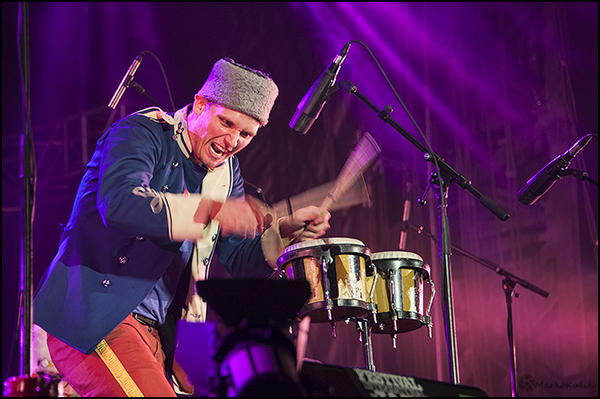 Instead of tak­ing Prozac, just watch Mucca Pazza. The music is a jazz-based fusion to my ear and is per­formed extremely well — in ‘we do not take our­selves seri­ously for even a nanosec­ond’ disco meets the civil war cos­tum­ing. The chore­og­ra­phy is crazy fun as well with cheer­lead­ers lit­er­ally thrown into the mix. 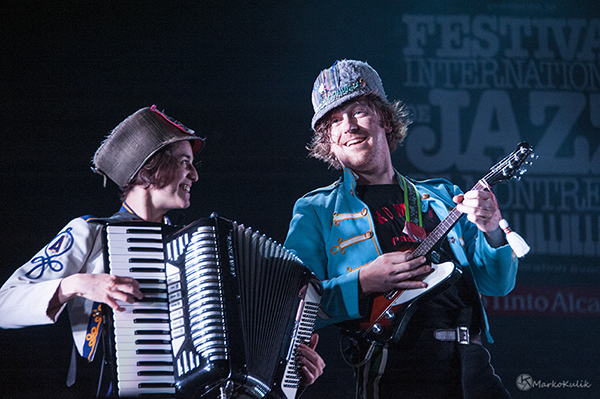 Did I say this is the most fun I’ve had at the Mon­treal Jazz fest in years? Well it is! There are only 3 days left to visit Le Mois de la Photo (Trans­la­tion: photo month) in Mon­treal. Le Mois de la Photo is a pho­tog­ra­phy event that takes place in Mon­treal every sec­ond year. I’ve been going to this event reg­u­larly in Mon­treal for about a decade. There is always a HUGE vari­ety of pho­to­graphic styles (from pho­tog­ra­phers from around the world) in this event and most exhi­bi­tions (espe­cially this year) are what I would call ‘alternative’. The above pho­to­graph (and this is one of the many exhi­bi­tions that I per­son­ally vis­ited) is a great exam­ple of ‘alter­na­tive pho­tog­ra­phy’ and‚ think­ing out­side of the box. The goal of this exhibit is not sim­ple, it requires thought; active thought. Peo­ple will expe­ri­ence this exhibit in a per­sonal way. Some will like it, some will hate it, and oth­ers will scratch their heads and go “Hmmmm”. Per­son­ally, I dug it big-time. I like things that are dif­fer­ent. I like to think and feel. I’m not into McDonald’s and their freak­ishly annoy­ing main­stream clown. With From Hand to Mouth (1993), a 22-metre long pho­to­graphic series, Jeff Guess treats view­ers to an orig­i­nal visual expe­ri­ence. 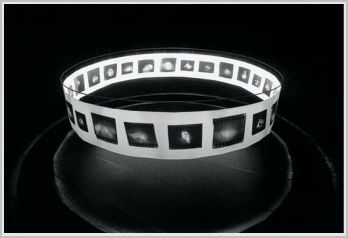 The piece takes the form of a cir­cu­lar panorama hung from the ceil­ing of a dark­ened room. The artist assigns a par­tic­u­lar place to view­ers, who are invited to step into the cen­tre of the instal­la­tion. With­out a priv­i­leged view­point that would make it pos­si­ble to take in all the images at once, the work invites view­ers to move about, to cir­cu­late. From Hand to Mouth is shown with a sin­gle, iso­lated pho­to­graph, Fonce Alphonse (1993). This exhi­bi­tion is just one of many that make up this year’s Mois de la photo. So get your shoes on and get out there this week­end to see the work before the exhi­bi­tion is over. Bring an open mind, your brain but leave your cash at home. The exhi­bi­tions and men­tal stim­u­la­tion are free. One of the many amaz­ing aspects of Mon­treal is the reg­u­lar gath­er­ing of dif­fer­ent peo­ple to enjoy what­ever is going on. 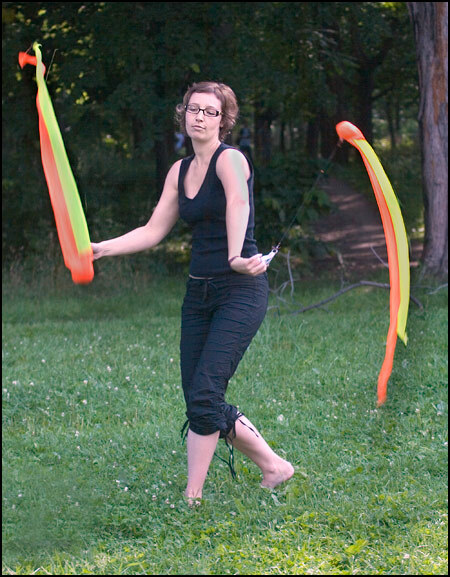 Sun­day in the Park (at Mount Royal) has been a tra­di­tion for over 10 years. Hun­dreds (some­times thou­sands) of peo­ple get together and play drums, dance, jug­gle, imbibe, play fris­bee etc. The girl in this pho­to­graph (I HAVE to start ask­ing names) looked so peace­ful prac­tic­ing her art that I HAD to take this photo — I asked first though.